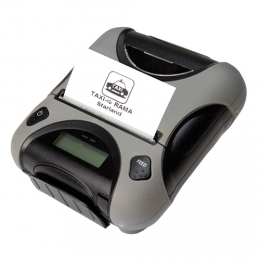 Handy, robust and independent the Star SM-T300i mobile printer prints receipts anywhere they are needed. It is entirely compatible with the most popular operation systems iOS, Windows and Android. Print from any common mobile device - via Bluetooth connection - without any problem. Additionally, the receipt printer features an RS232 port for serial connection. Star places great value on simple handling. Thanks to its Drop-In Print paper handling, changing rolls takes only a few seconds. The SM-T300i comes ready to go in a complete package, including battery pack, serial connection cable and charging adapter, as well as a practical belt clip. The housing is IP54-certified to protect it against dust and splash water. Plus, it withstands falls from up to 1.5 m, making it ideal for use in the field. It prints text, barcodes and graphics cleanly at a print speed of up to 75 mm/sec. at 203 dpi 8 dots/mm. Use the SM-T300i in extended operation up to eight hours without having to change the battery.